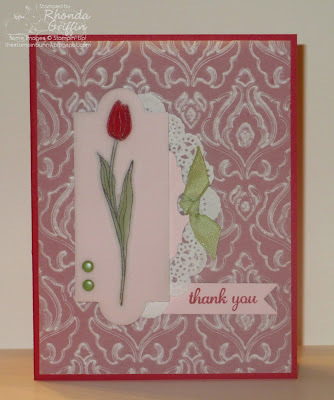 Welcome to the Stampin' Addicts New Catalog Blog Hop. I hope you'll enjoy a quick trip through this fun new catalog with us. If you're traveling in order, you've seen the sweet Zoo Babies creations on Rubber Stamping & Card Making with Yapha. Should you get lost or want to chat, the list of participants is available on the Blog Hop thread on Stampin' Addicts. On this first card, I stamped and die cut what I consider the Alstroemeria/Peruvian Lily stamp from Vellum cardstock...I used Pistachio Pudding and Strawberry Slush for intense color. I used bits of mini glue dots to attach it to a white base cut from the Labels framelits. 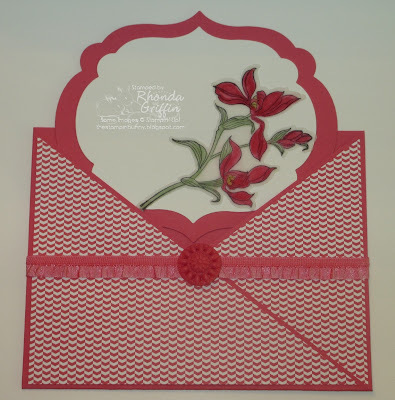 Backed with the larger layer in Strawberry Slush, it is an elegant surprise when slid from this Criss Cross card which uses the Strawberry Slush Designer Series paper as well as the Boutique Detail embellishment and the Stretch Trim. I liked how versatile it is, so I'll add a sentiment to the inside when I'm ready to sign and send it. Next is what I consider a female Blue Bird with the typical muted colors....Soft Sky is the card base and the bird's base. I cut the oval from the woodgrained card base. It is always difficult for me to be sloppy, but I sponged Baked Brown Sugar over the Woodgrain Embossing Folder and smudged color outside the lines on the water color paper around Ms. Bird. The Crisp Cantaloupe Stretch Trim made a nice edging for the image oval, and the color is perfect for Ms. Bird's chest. I twisted the Soft Sky Seam Binding Ribbon for a little more texture. The Sentiment is from the hostess set, Simply Sketched. 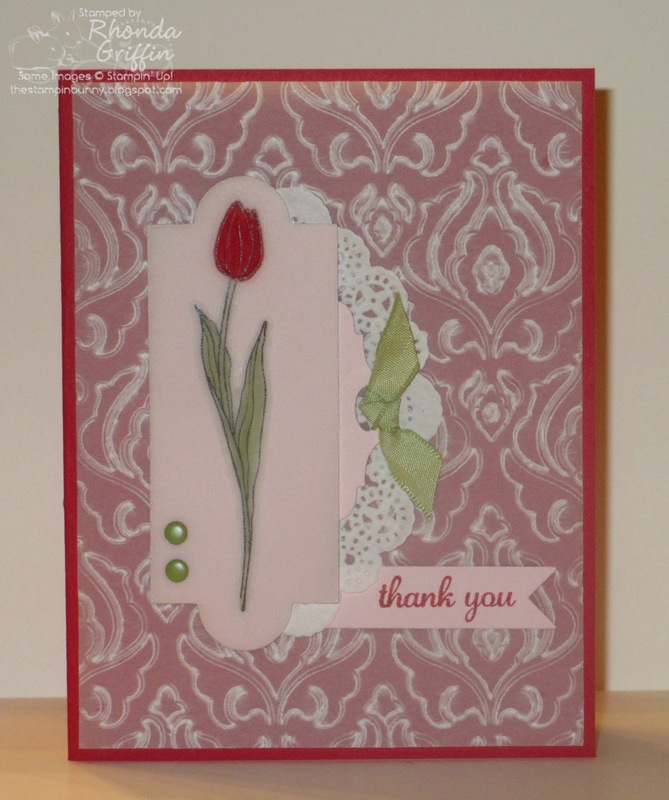 This Thank You card features the Tulip stamp from Backyard Basics and lots of Vellum. It is die cut from Vellum, and the Beautifully Baroque background is also Vellum...The is also layered with vellum over the Pink Pirouette Die Cut from Apothecary Accents. The bit of Pink Pirouette peeking out is from the Chalk Talk Framelits. Now, it is time to travel to Stitchin n Stampin' on Paper where Kim will show us her beautiful designs using the Regarding Dahlias set. How Beautiful and you know the names. I call them the birdie, long flower etc. Love your work. Gorgeous cards! Your coloring is just fabulous on all of these. So lovely! These are wonderful. Thanks for reminding me how beautiful embossed vellum can be. 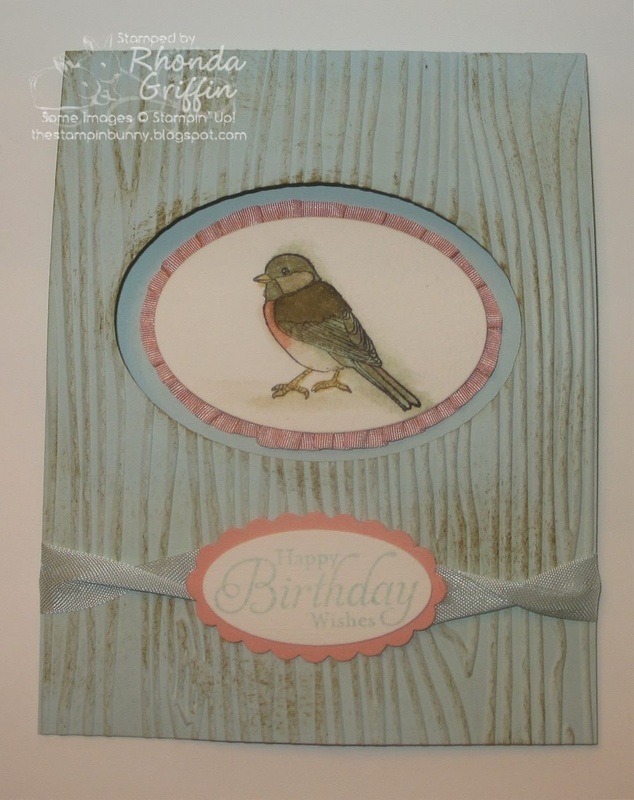 And anything with a bird is my favorite - you created a beautiful card and the sponging on the background really brought out the woodgrain. Lovely cards, all. Wow, wow, wow! These are fantastic!! Gorgeous! So much rich detail and texture. Love it! Beautiful coloring, Rhonda! I am in love with your first project!! Lovely cards. The flowers are beautiful, but that bird is my favorite--so pretty. Being messy worked on this one. Beautiful cards as usual. The bird one in the middle is my favorite. Love the woodgrain and the "stain". Such beautiful cards! The depth of color on the first one is gorgeous! And thank you for identifying the flowers and bird, too. Now I'll know how I'm supposed to color them! These are all just beautiful. I didn't think I needed this set, but you are doing a good job convincing me otherwise. Beautiful cards Rhonda. I have tons of vellum and never think about using it - thanks for the reminder!! I forgot how great it looks!